First of all, what is a CSA? CSA stand for Community Supported Agriculture. It’s a way for farmers to get some capital early in the season and offset heavy spring costs before the season ramps up. 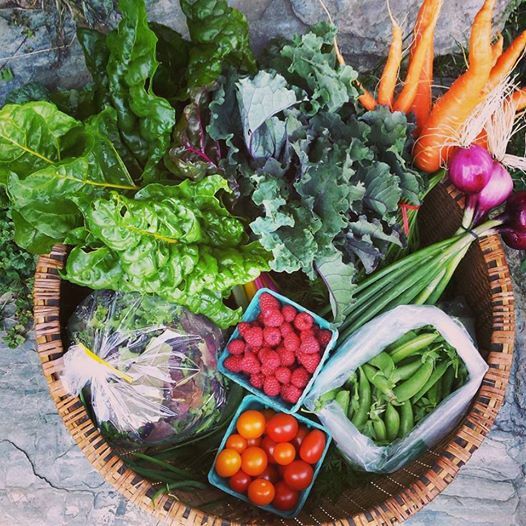 The standard CSA program consists of a weekly share of vegetables, paid for with a lump sum. In exchange for “investing” in the farm, shareholders (or “members”) get to develop a direct relationship with their farmer, connecting more with the people who grow their food. CSA shares look expensive, but if you divide that number by the total number of weeks that you’ll be receiving food, you can see that it’s actually a very reasonable amount to be spending on fresh, local produce each week. As an additional thank you for dedicated support of the farm, there’s usually a 10-15% discount included! What does a CSA look like at Field Stone Farm? Field Stone Farm has offered a CSA for many years. As our farm has changed over time, we have discovered that the classic CSA model – a designed box of produce every week, delivered or picked up on farm – may work well for other farms, but it isn’t a model that fits our operation well. Lots of farms suffer by spreading themselves too thin, and we’ve looked hard at how best to structure our business that maximizes efficiency while staying connected with our core value: to feed our community the highest quality, most nutritious produce. Our Market Share CSA program is based around the efficiency of shopping at the farmers market, rewarding loyal customers for their dedication while encouraging early-season cash support when it is most needed. Is a Market Share right for me? Shopping at the farmers market allows you the flexibility to pick and choose what – and how much – you want to eat for the week. With opportunities to shop on Tuesday at the Northfield Farmers Market, Saturday at the Montpelier Farmers Market, or any day in between at the Green Mountain Girls Farmstand, you’re not locked in to a scheduled weekly pick-up. You can buy heavy one week, and take the next off without feeling like you’re missing out. It’s all up to you! If you like the sound of all that flexibility, then a Market Share would be a good fit and you should move on to our Market Share sign-up! If you look forward to a surprise box of veggies every week without having to make the choices yourself, if you don’t like shopping at the farmers market, or if you enjoy adhering to a schedule then maybe this style CSA isn’t right for you and that’s ok too! The Market Share is a part of the Bridge, a project between Green Mountain Girls Farm and Field Stone Farm.